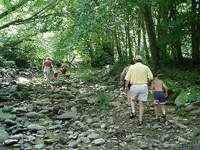 The High Country of Western North Carolina is one of the most popular outdoor destinations in the Southeast. Highland Hills Motel and Cabins is centrally located between four ski slopes, several golf courses, and countless hiking trails. 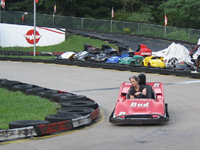 Fun 'N Wheels is an exciting go-kart race track located next to our motel. 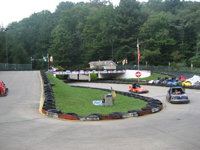 They feature an arcade, a small Ferris wheel for children, bumper cars, a gyro, and fast paced racing. The entire family is sure to have a good time and enjoy some friendly competition. Open daily from memorial day to labor day. Boone, Blowing Rock and the surrounding areas are dotted with gorgeous mountain golf courses that are playable year round (in some cases) and seasonally from early spring through late autumn. There are nine golf courses within twenty miles of Boone. For the more experienced player looking for a challenge, Boone Golf Club is minutes down the road, and Red Tail Mountain is just across the Tennessee line in Mountain City. For the player looking for an easier course they can feel more confident playing, the nine hole Willow Creek Golf Course is just a mile down Highway 105. This area is home to Appalachian Ski Mountain, Ski Beech, Hawksnest Ski Resort, and Sugar Mountain, making Boone and the surrounding area an immensely popular vacation spot for snow sports enthusiasts. Skiing, snowboarding, tubing, and ice skating ensure that everyone in the family can find something they will enjoy while on the snow.